Learn life-saving skills such as CPR and first aid. Check your insurance policies for hazards you may face. Know practical safety steps like shutting off water and gas. As Lake County joins in observing National Preparedness Month through September, work with your family and community to develop an action plan, so you can be prepared if an emergency should occur. Check out these resources that can help you plan. An emergency can happen in your community at any time. 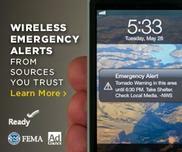 Prepare yourself and your family for any emergency by seeking immediate and reliable information. Watch this video to learn how. Looking for a job? The Job Center of Lake County will offer a variety of resources this month, including tips to succeed in your next job interview and much more. View this month’s schedule. Lake County Workforce Development is piloting a text-messaging service where you can opt in and receive occasional text messages regarding employment events, paid internships and more. You can opt out at any time. Sign up now! The Stormwater Management Commission is currently looking for two fall 2018 ravine interns who will spend most of their internship outside collecting data for slope and channel erosion, locations of stormwater pipes and discharges, and more. Applicants must be able to work primarily outdoors within natural resource areas, (e.g., wetlands, ravines and streams), occasionally be in the office, and be willing to engage in limited to moderately strenuous physical activity. Apply today! The Lake County Sheriff’s Office is accepting applications for Lake County Sheriff’s Auxiliary Deputies. The Auxiliary Deputy Unit is comprised of members who give back to Lake County through community service in the area of law enforcement. The unit assists other Sheriff’s Office divisions as well as municipal police departments in times of natural and man-made emergencies or disasters. Applications are available at the Lake County Sheriff’s Office, 25 S Martin Luther King, Jr. Ave, Waukegan, or at the Lake County Sheriff’s Auxiliary Deputy website. Applications are due by Sept. 30. Lake County prides itself as being a leader in public health, working to enhance access to mental and behavioral health services through partnerships between the Health Department and law enforcement agencies, the work of the Lake County Mental Health Coalition, and addressing the rapidly increasing opiate problem through the Lake County Opioid Initiative. There are many services available 24/7 to those experiencing problems related to emotional and mental illness or drug and alcohol addiction. Lake County Public Works will soon begin its semi-annual water hydrant flushing program. 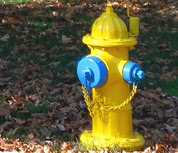 After hydrant flushing, customers may notice a slight discoloration of the water. Residents are urged not to do laundry during periods of flushing to avoid clothes to be stained. This is not harmful and will dissipate after a short time. It is recommended to run cold water for several minutes to clear your pipes. View the schedule. With so many farmers markets across Lake County, our residents have many options for picking up fresh produce, packed with nutrition and flavor. Watch this video as Chef LaiSha Ponder from the Lake County Health Department shares how you can bring that market freshness to your table with two easy, mouthwatering dishes, a summer ribbon salad and a sautéed vegetable mélange. Go to your local farmer’s market using our Farmers Market Finder and give these recipes a try! A newly completed 1.9-mile paved trail now connects Lyons Woods Forest Preserve in Waukegan to the Robert McClory Bike Path and local parks. The Lake County Forest Preserves, City of Waukegan, Waukegan Park District and the Village of Beach Park partnered to create this trail extension. It represents the first phase of a longer 6.9-mile regional trail that will continue west through Waukegan Savanna Forest Preserve and eventually connect to the Des Plaines River Trail at Sedge Meadow Forest Preserve in Wadsworth. 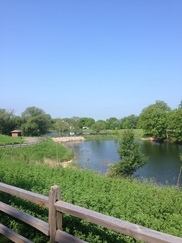 Visit Lyons Woods today. Please take our 10-minute survey below to answer questions that will help us understand how you enjoy Lakewood and what opportunities to explore for the preserve’s future. The survey will be open until Sept. 24. Take our survey!